This new image of Tycho's supernova remnant, Tycho for short, contains striking new evidence for what triggered the original supernova explosion, as seen from Earth in 1572. Astronomers have identified what appears to be a cosmic smoking gun for a historic supernova explosion, a find that may also help with the search for elusive dark energy in the universe. The new evidence suggests the famed Tycho supernova, located about 13,000 light-years from Earth,formed when its parent star stripped too much material from a nearby companion, forcing it to detonate in a massive thermonuclear explosion. The find was made using NASA's Chandra X-ray Observatory. A study of the exploded star's remains also suggests that, in general, stars could survive the intense impact generated when their stellar companions undergo a violent supernova death. Type Ia supernovas have been used as guideposts in gauging the rate of expansion of the universe – an effect attributed to the prevalence of an invisible, repulsive force throughout space called dark energy. This is an artist's impression showing an explanation from scientists for the origin of an X-ray arc in Tycho's supernova remnant. 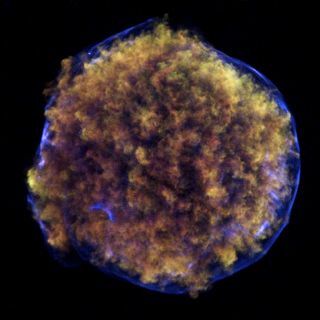 While studying the Tycho supernova with the Chandra observatory, researchers found an arc of X-ray emission in the supernova remnant. This arc, the researchers suspect, was created by the shock wave generated when a white dwarf exploded (the original Tycho star explosion) and blasted material off the surface of a nearby companion star. In the past, astronomers have come up with different ideas about what triggers Type Ia supernovas. One popular scenario involves the merger of two, small white dwarf stars. (White dwarfs are stars that have exhausted their nuclear fuel and are near the end of their life. That accounts for their low luminosity.) In this white dwarf scenario, no companion star or evidence of material blasted off a companion star should exist after the initial explosion. In the other main competing theory, a white dwarf draws material off of a "normal," or sun-like, companion star until a thermonuclear explosion occurs. While both supernova scenarios could occur under different conditions, the latest observations of Tycho from Chandra suggest that the latter theory is the most likely, researchers said. Can companion stars survive a supernova? The new study of Tycho also appears to show the incredible resilience of stars, as the supernova explosion appears to have blasted only a small amount of material off the companion star. Earlier studies with optical telescopes also revealed a star within the supernova remnant that is moving much more quickly than its neighbors, hinting that this could be the missing companion. This image shows iron debris in Tycho's supernova remnant. The site of the supernova explosion is shown, as inferred from the motion of the possible companion to the exploded white dwarf. "It looks like this companion star was right next to an extremely powerful explosion and it survived relatively unscathed," said Q. Daniel Wang, of the University of Massachusetts in Amherst, in a statement. "Presumably, it was also given a kick when the explosion occurred. Together with the orbital velocity, this kick makes the companion now travel rapidly across space." By studying the properties of the X-ray arc and the possible stellar companion, the astronomers determined the orbital period and separation between the two stars in the binary system before the supernova explosion. The period was estimated to be about five days, and the separation was only about a millionth of a light-year (which is equivalent to less than a tenth of the distance between the Earth and the sun). In comparison, the supernova remnant itself is about 20 light-years across. The researchers also found other clues from the arc to support the idea that it was blasted away from the companion star. The X-ray emissions of the remnant, for example, show an apparent "shadow" next to the arc, which shows it may have blocked debris from the explosion by the expanding cone of material stripped from the companion. "This stripped stellar material was the missing piece of the puzzle for arguing that Tycho's supernova was triggered in a binary with a normal stellar companion," Lu said. "We now seem to have found this piece."